Charlie Bronson is in a witness protection program in a small out-of-the-way town after being involved in a number of bank robberies and informing on his cohorts. He decides to support his girlfriend in her career and travel with her to California. Leaving the witness protection program is a great risk, but he’s willing to take that risk for Annie (Kristen Bell). Along the way, Annie’s jealous ex-boyfriend informs on Charlie, and his old crew come after him. Annie discovers Charlie’s real identity and past criminal actions – is this the same man she fell in love with? But she has little time to think about it as she is kidnapped by Charlie’s old gang. 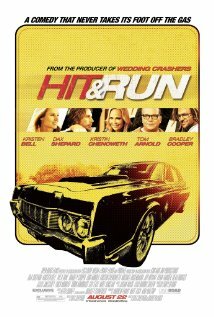 Hit and Run is a romance, comedy, and action movie. There was quite a long, dragged-out car chase in the middle that I just couldn’t sit through (had to use the fast forward button). But apart from that, this movie has a lot of spark. Bell was fabulous (loved her a long time ago in Forgetting Sarah Marshall, see also When in Rome, and You Again). Points go to Bradley Cooper as Alex, one of the crims sporting dreadlocks. It was quite a different role for him and he was pretty amusing. I wouldn’t normally be a huge fan of Dax Shepard, especially in anything romantic, but he did pull it off and was a terrific match for Bell. Great movie to watch with some-one who doesn’t like rom coms! Posted on 17/07/2013, in the whole rom com list and tagged Bradley Cooper, Dax Shepard, Kristen Bell, Kristin Chenoweth, Tom Arnold. Bookmark the permalink. Comments Off on Hit and Run.